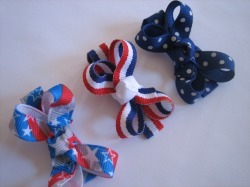 Here at Bambalins Creations we specialize in Hair Accessories for all the girlie girls. I have many different goodies ranging from hair accessories to jewelry. All of my pieces are handmade and make perfect gifts for all ages. New Inventory is being created Everyday so check back often! - "Very cute and well made. No slip grip is great!! It will definitely stay in my daughter's fine hair. Thanks!" - "This seller was hugely helpful! I had a lot of questions and she went out of her way to answer all of my question IMMEDIATELY. She was happy to customize an item for me so it would work for my particular needs. Unbelieveably FAST shipping! A pleasure." - "Absolutely gorgeous bows!!! A+++ quality. Super nice seller who accomodated my request for fast shipment. Thank you sooo much! Will be back"